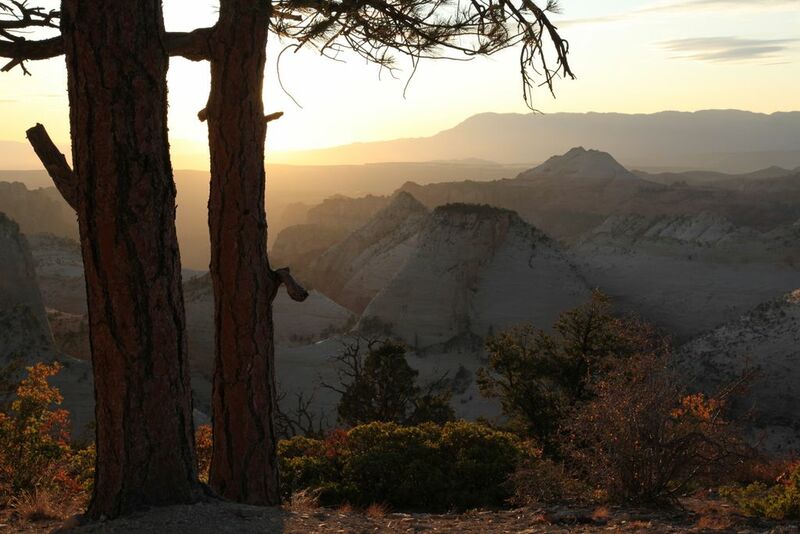 We arrived at Zion National Park just as the sun started to sink into the horizon. I picked up Dale and Thomas at the LA airport around 10 am and we made the 7 hour journey to the park. We were hoping to secure a spot at the South campground but they were sold out. The ranger told us there were some campgrounds up the road a bit that might have some room. We ended up backtracking several miles until we came across a sandy piece of land with people camped out on it. We pulled in and asked some guys what the situation was, and they explained that we could just camp wherever there was room and it was free. Odd. We later found out that the land is owned by the state because its a flood zone. We drove back into town to grab some dinner before heading back and crashing for the night. The next morning, we woke up early in order to get over to the ranger station. We were unable to purchase our permit ahead of time so we wanted to get there around when it opened (7am). Once there, after a short wait in the freezing cold, we had our permit for Campsite 3 on the west rim. We decided that we would start our trek at the Emerald Pools Trail and then work our way up. We hopped off the shuttle at the Lodge, and were greeted by a flock of wild turkeys. Dale chased them around a little before we headed towards the Emerald Pools. After a short hike, we arrived at the middle pool. Nothing spectacular so we headed to the upper pool. While this was a little better, it was still nothing that interesting. 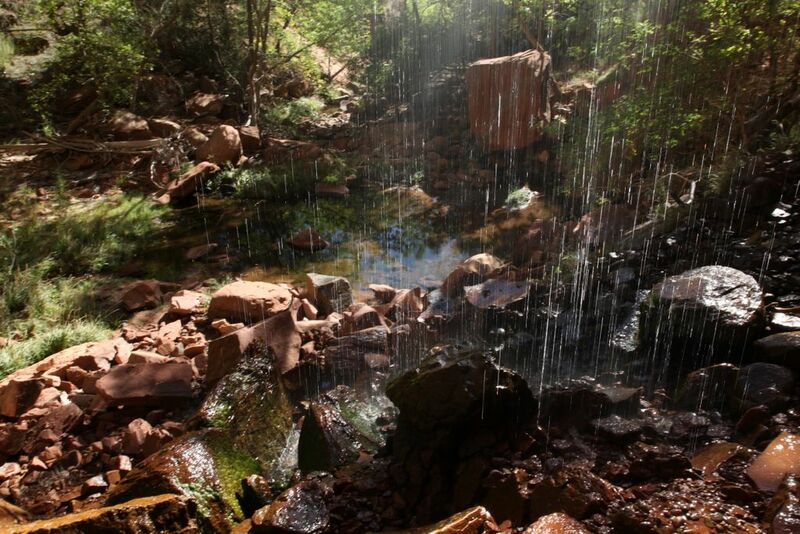 Luckily, the lower pool included a small waterfall that you were able to walk under and made the hike worth while. 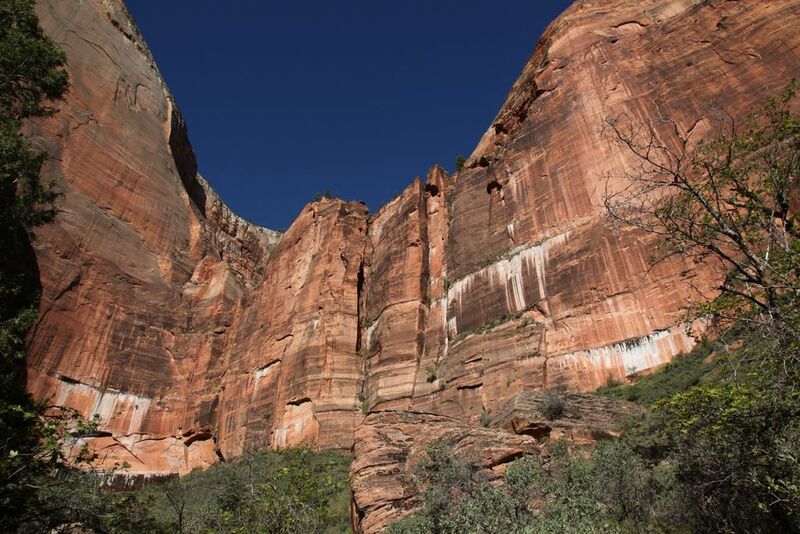 Now that that was out of the way, we started for Angel's Landing. We hiked a leisurely mile before the trail takes a turn and heads straight up. You are greeted with a series of switchbacks that make the legs burn but give some amazing views of the valley below. One section of switchbacks is the famous Walter's Wiggles, which turns literally every 10 feet and resembled Lombard Street in San Fran. 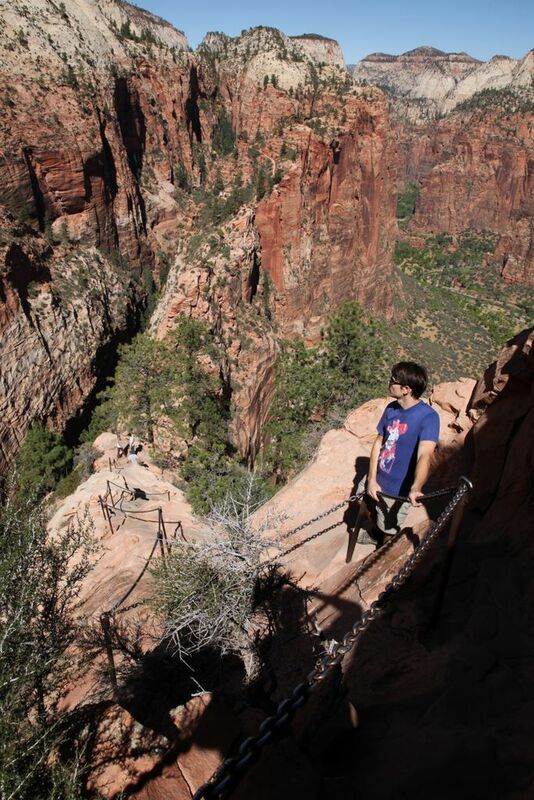 After climbing up the trail for about a mile, you end up at the fork for Angel's Landing. This is a popular lunch spot as there were tons of people either coming back from Angel's Landing, getting ready to go, or refusing to consider it. 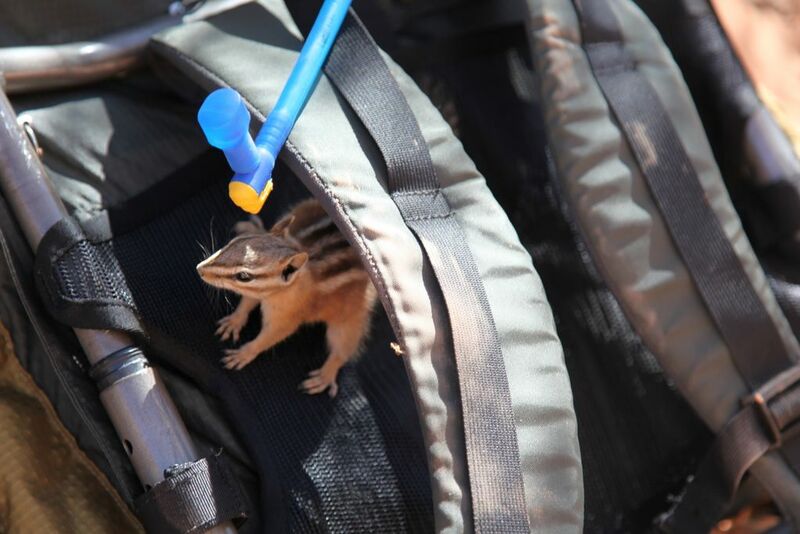 There were also a gang of renegade chipmunks that started running around on our packs. After resting for a second and making sure our packs were zipped up (since we were leaving them there), we started our ascent to Angel's Landing. The sign says it's a half mile, but due to the vertical nature of the hike, it felt like a whole lot more. It starts easy enough, but you quickly come upon some chains that you have to grab onto to steady yourself. 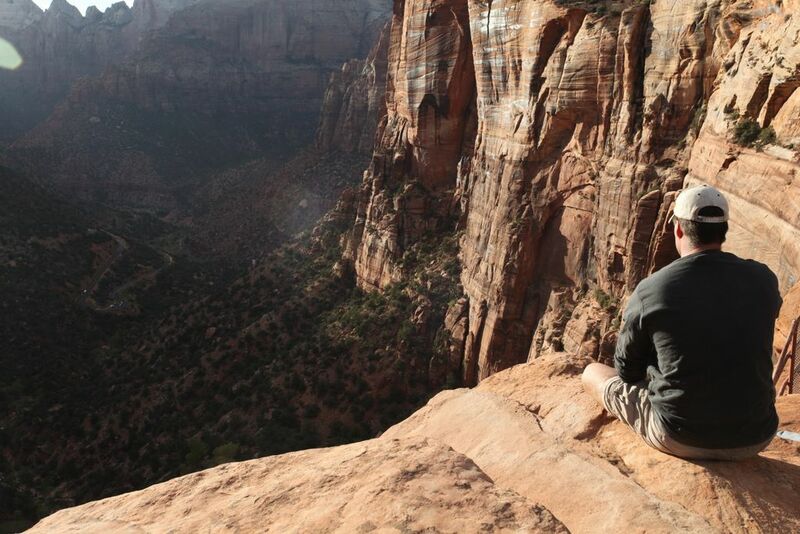 On either side of you, there are 1000 foot drops... and the path is only a few feet wide. It was very reminiscent of climbing half dome in Yosemite. After about 30 minutes of climbing, we finally reached the top. After resting and taking some pictures, we headed back down. Upon arriving back at our backpacks, Thomas noticed that he was missing a bag of M&Ms and a bag of sunflower seeds. Evidently the chipmunks found a way to get into his bag and feasted on his food. Nothing could be done now, so we grabbed our packs and started making our way to the campsite. From Angel's Landing to West Rim Spring is about 2.5 miles. 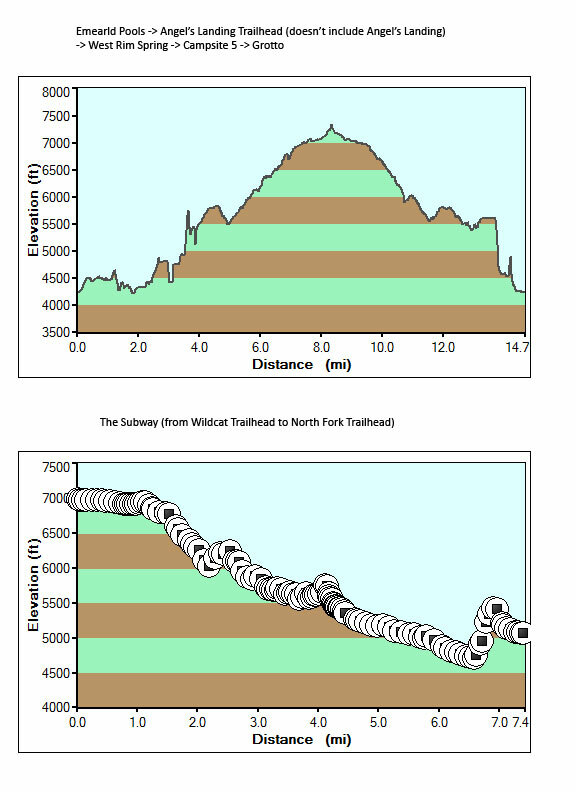 There are several steep sections that include switchback after switchback and a section of the trail that was literally carved out of the side of a rock. The path was about 4 feet wide but dropped several hundred feet off the side and I did my best to not spend much time thinking about the consequences. Instead we pushed on and finally arrived at the springs. We were all out of water so it was a very welcome site (despite appearing to be nothing more than a hole in the ground). We hiked the final mile to the campsite, set up the tent and then headed up the trail to watch the sunset. There were a couple of other campers from Campsite 4 that joined us to watch the show. As we watched the sun slowly drop behind the sandstone ridges in the distance, our appreciation for the beauty of the park grew. The setting sunlight on sandstone is truly magical. After the sun was gone, we headed back to camp, ate dinner and passed out. The next day, we returned to the valley and did a couple of day hikes. The first was along Riverside Walk, which was fairly uneventful. The trail itself is wheelchair accessible, so that gives you an indication of the difficulty. The only thing interesting that happened is we saw a tarantula fall from the cliffs onto the ground. He was laying on his back so I gave him a hand and flipped him over. Once we were at the end of the trail, there were some small rapids and the beginning of the Narrows (which we would like to do). The second hike was to Overlook Trail. We wanted to check out the sunset from up high. After a nice casual hike, we arrived at the overlook, which gives a nice view of a valley (despite there being a road running through it). After the sun was below the horizon, we had to find a place to sleep for the night and ended up back at the campsite from night one. Nothing special but the only thing we were planning on doing is sleeping, so it worked out well. Our last day in the park, our sites were set to tackle the Subway, which is what drew us to the park in the first place. After getting a late start, we packed up our gear (including the wetsuits we picked up the night before) and headed towards Wildcat trailhead. After a wonderful four mile hike through scenic plains and gentle sloping rock formations (which was challenging if only for staying on the trail), we finally arrived at the canyons that represent the start of the subway. Once we recognized that to continue required getting wet, we threw on our wetsuits and made the plunge. Even with the suits, it was cold. It made us wonder how the group behind us would fare without any protection. 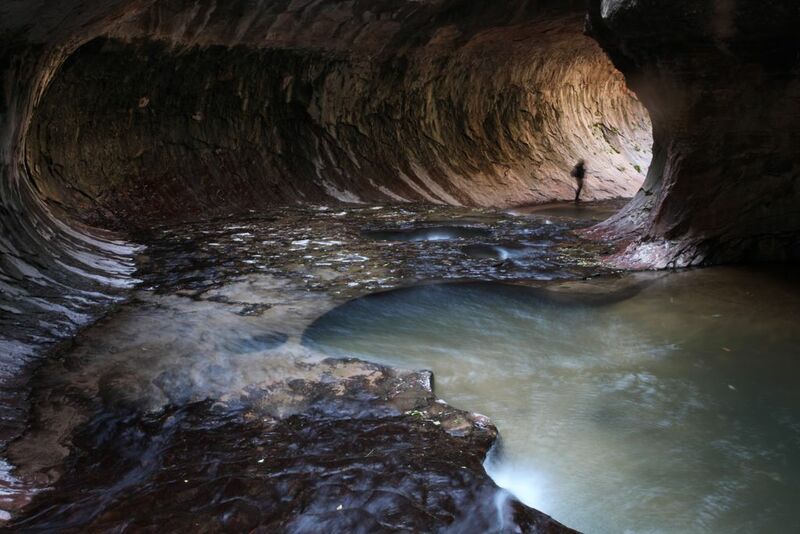 We continued along, hiking through the canyon, rappelling over a rock here and there, swam through more cold water, and then finally made one last rappel to end up in the Subway. 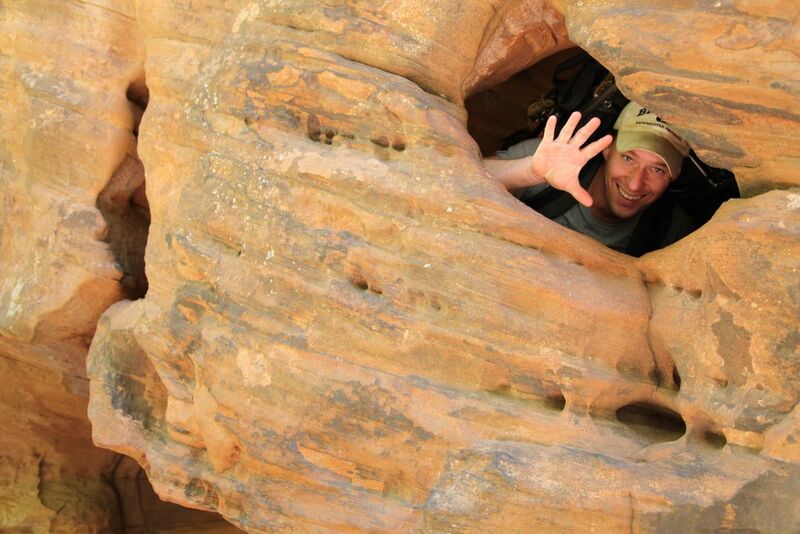 This was a great spot, but the amount of sun leaking into the canyon was minimal. It made me wish we had more time to wait until the entire thing was drenched with light. Unfortunately, that was not an option so we pushed on. After a mile or two of hiking in and out of the stream, we finally shed our wet suits and headed up the canyon wall, which was a short but extremely vertical climb. Once at the trailhead, I hitched a ride back to the car and circled back to scoop up Dale and Thomas. We made a final trip into town to return our wetsuits and pick up some souvenirs, and then it was time to head back to LA. We had the pleasure of seeing the setting sunlight light up the sandstone cliffs one last time before we found ourselves traveling though the night. 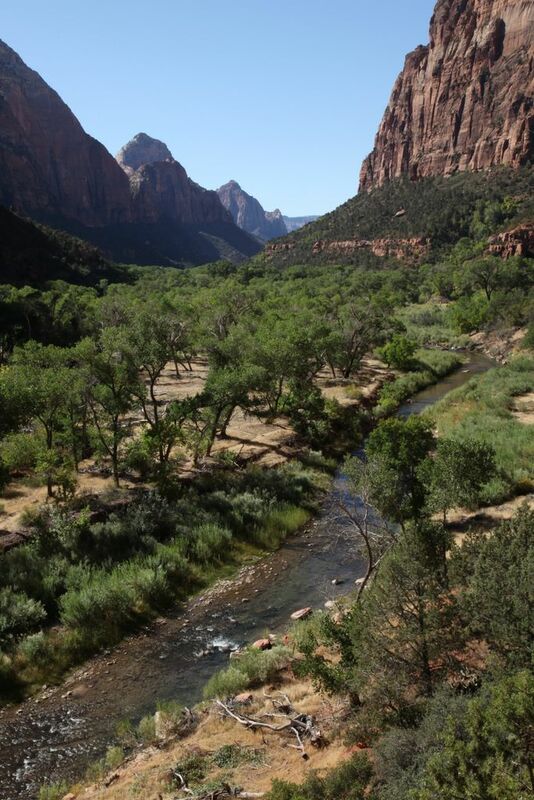 Zion is a special place with an appropriate name.